Glyn Phillips is passionate about the music of the world! 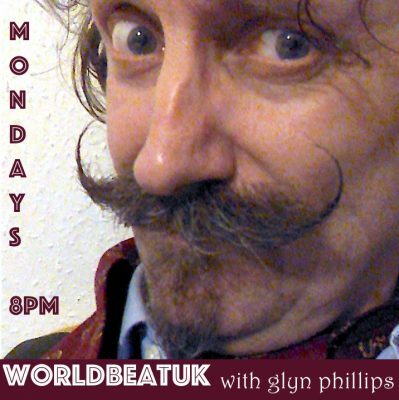 His two-hour weekly show, WorldBeatUK, brings you the latest releases and peeks at forthcoming albums from around the globe – the sounds of five continents, innumerable islands and a multitude of cultures – all presented with enthusiasm and a desire to share his knowledge and new discoveries! WorldBeatUK takes you from the favelas of Brazil to the forests of Finland, from the heart of Africa to the very edges of Asia and from the shores of the Caribbean to the urban high-rises of Europe. With record labels and artists from around the globe sending him new releases almost every day Glyn literally has the world at his fingertips and guarantees you’ll hear something every week that will whet your appetite and pique your curiosity! Join him Mondays (8-10pm) or catch up on Mixcloud. Take a chance on something new! On the April edition of WorldBeatUK, there’s a mini-focus on the country of Turkey, a bit of a journey around the Middle East and the Eastern Mediterranean, old school cumbia and chicha, new-school tango, a slew of new Americana releases, two Finnish women go in search of a disco somewhere near the Arctic Circle and a whole heap of experimental cross-cultural fusions that are really very interesting indeed!